Photo #1: - (Below) Cruise to Italy ticket & menu collection. M.S. 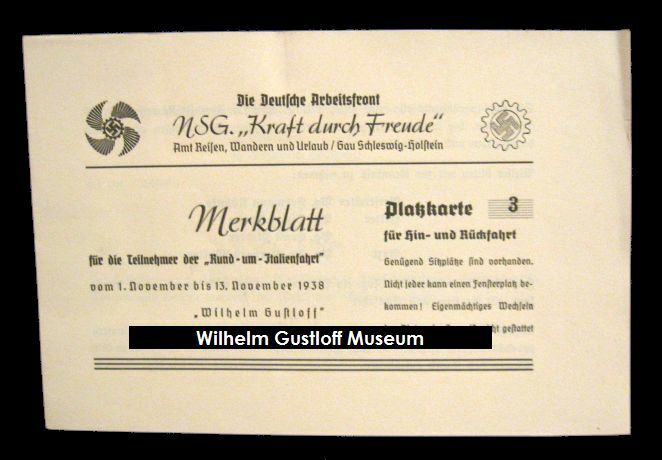 Wilhelm Gustloff 22. Reise, 3. Rund. 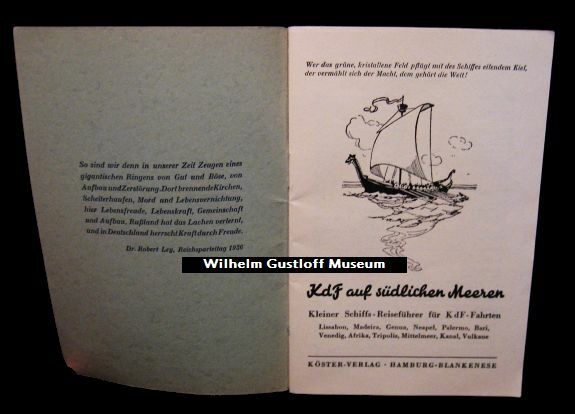 Includes 11 menus dating November 26th to December 6th, 1938 and a complete ticket booklet (Kontroll-Nr. 0499, Kabinen Nr. 823. Photo #2: (Right) - Cruise to Italy memorabilia collection. 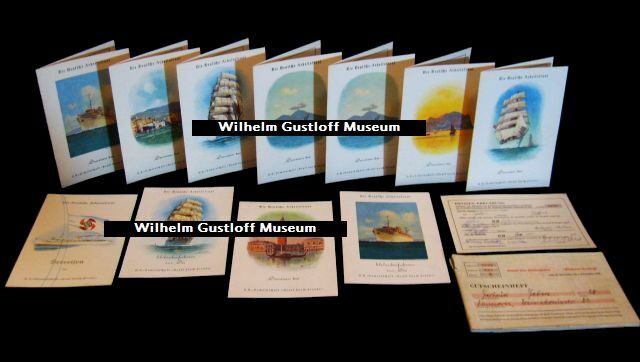 This is a stunning collection of items purchased from an antique shop in Germany in 2009. 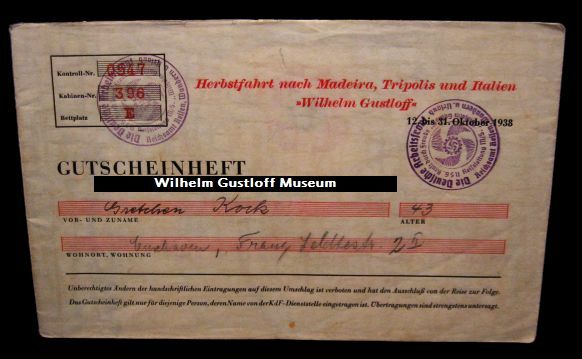 The former owner, Gretchen Kock from Hamburg, traveled on the Wilhelm Gustloff from October 11th to November 1st, 1938 - this was the longest voyage the Wilhelm Gustloff ever completed! Officially, the voyage is from October 12th - October 31st, but agendas exist for the day prior and after the voyage marked 19 Reise. 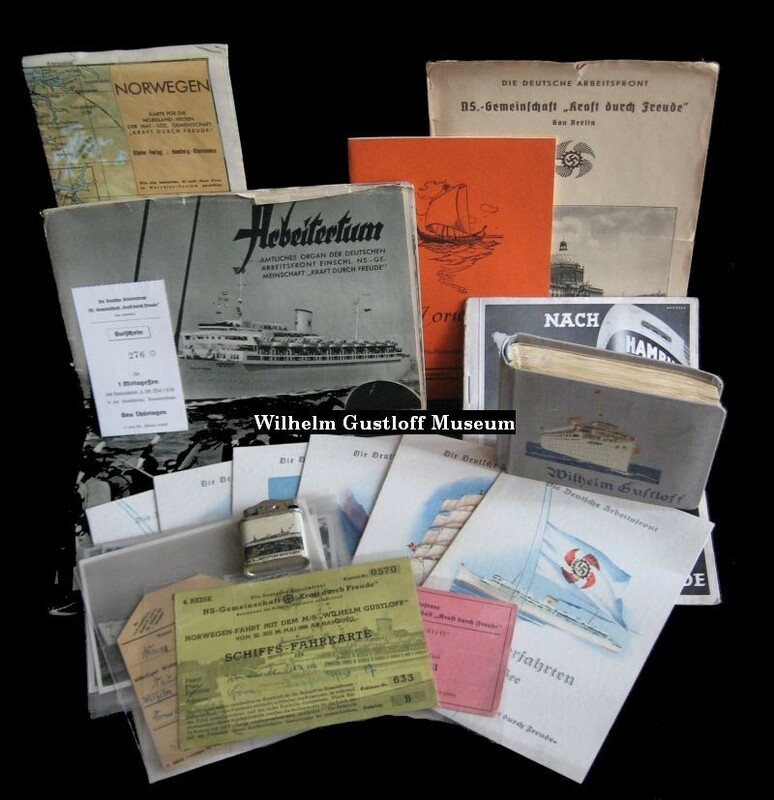 The collection includes: A never-used photo album measuring 29cm x 22cm in mint condition, 20 menus & daily programs, Complete ticket booklet, Telegram receipt sent from the Gustloff, official souvenir photos of the ship, Genoa, Tripoli, Naples, and Madeira (60 in total), Foreign currency explanation chart, reservarion notebook, KdF travel map, Southern Seas travel booklet, notes & other documents, as well as passenger photos of the liner. 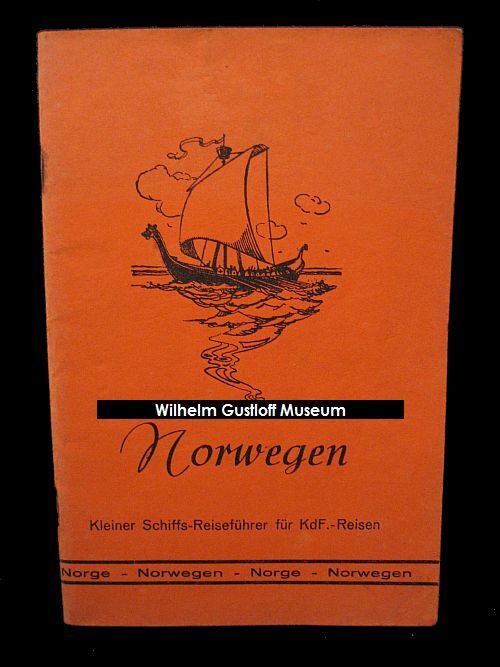 Photo #3 (Below Right) - Cruise to the Norwegian Fjords Ticket and menu collection. 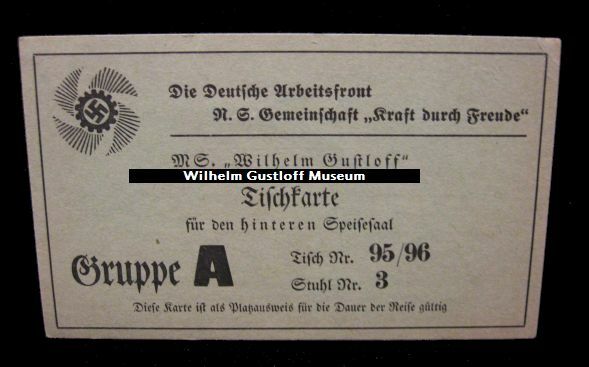 Dated July 8th - 14th, 1939, this was her 43rd of 50th cruise from the collection of Else Schnberf. 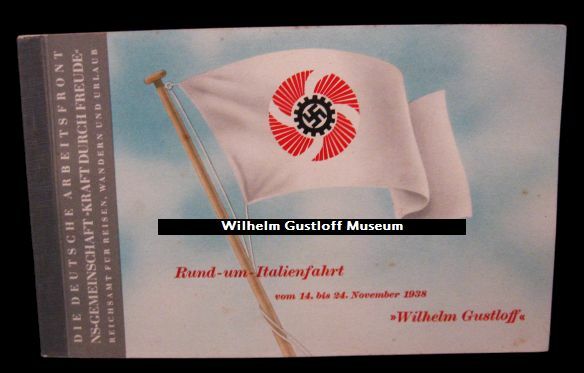 The amazing menus of this collection include the hard to find triple Nazi flag cover. The paperwork includes 7 menus, ticket booklet, table card, luggage tag, coupon booklet, and KDF foldout agenda. One interesting note is that while this was her 43rd cruise, the foldout agenda is marked as the 42nd cruise, but the luggage tag has 44th cruise - all are with the same dates. 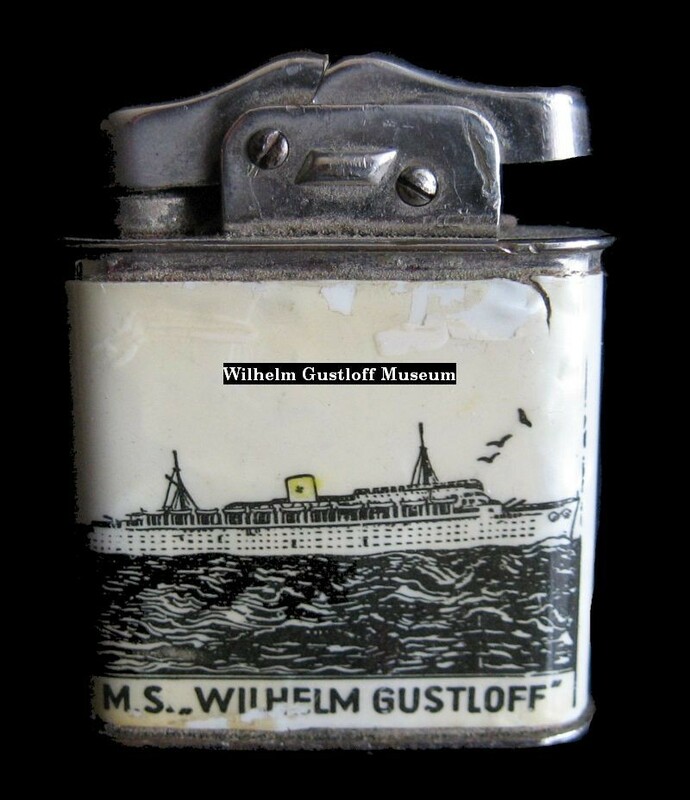 Wilhelm Gustloff - Italian Cruise. Effects from the first photo at top right. Voyage #19: October 11th - November 1st, 1938. Ticket booklet contents by photo: Not all pages are covered. Each stop has a photo of the destination, disembarking ticket, map , and information on the stop. 2. Front cover behind tissue paper dust cover. 3. Intorduction and overall trip plan for the voyage. 4. Fold-out map of the route the Gustloff will take on this voyage. 5. Communications and Directions. Notes before the voyage. 6. Left tab - Where the train schedule and tickets would have been. The green stamps are provision vouchers for the trip. 8. 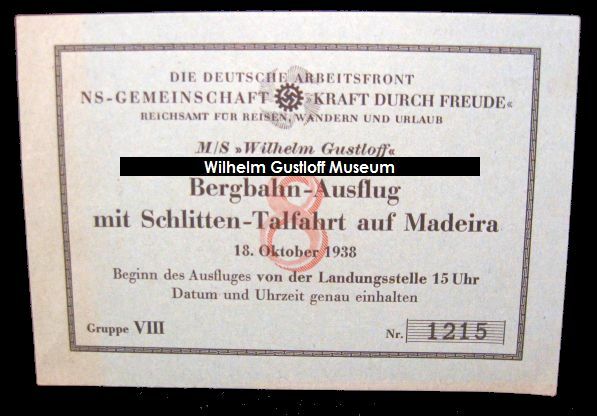 Ticket for excursion to Madeira with photo. 9. 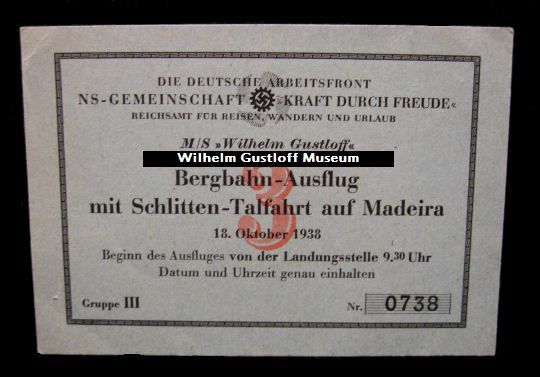 Photo for excursion to Madeira with ticket used. 10. Information and map of Madeira. 11. Naples photo with ticket missing. 12. Sabratha photo with ticket missing. 13. Same photo as prior showing flag tab of country visiting. 14. Tripoli photo with ticket detached. 15. Information and map of Tripoli. 16. Genoa photo with attached ticket. 17. Statement page: Schedule notice and tickets for the return voyage. 18. Gotthardbahn photo with ticket missing. 19. 4 more provision vouchers for the voyage. 3 in tact. 20. 75% off voucher for the trip. - All the photos below are of items also used onboard this voyage. Kraft Durch Freude Southern Seas Travel Booklet & interior cover. Train ticket information to the docks. Group 3. 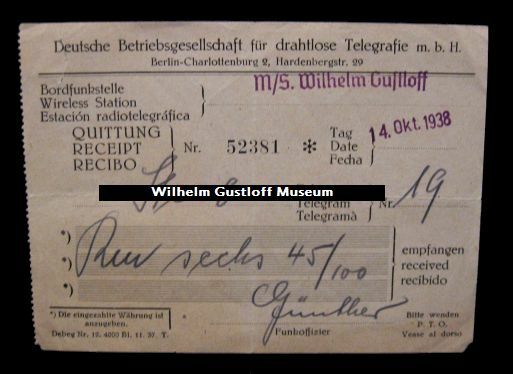 Receipt for a telegram sent onboard the Gustloff. 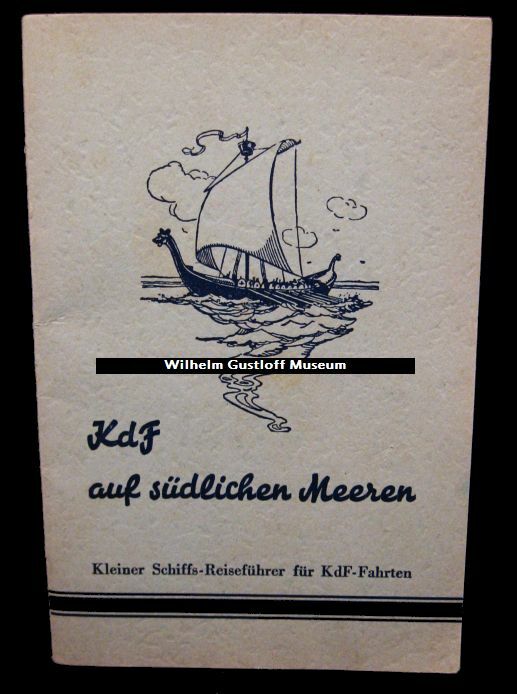 Ticket booklet for the Wilhelm Gustloff - Italian Cruise. 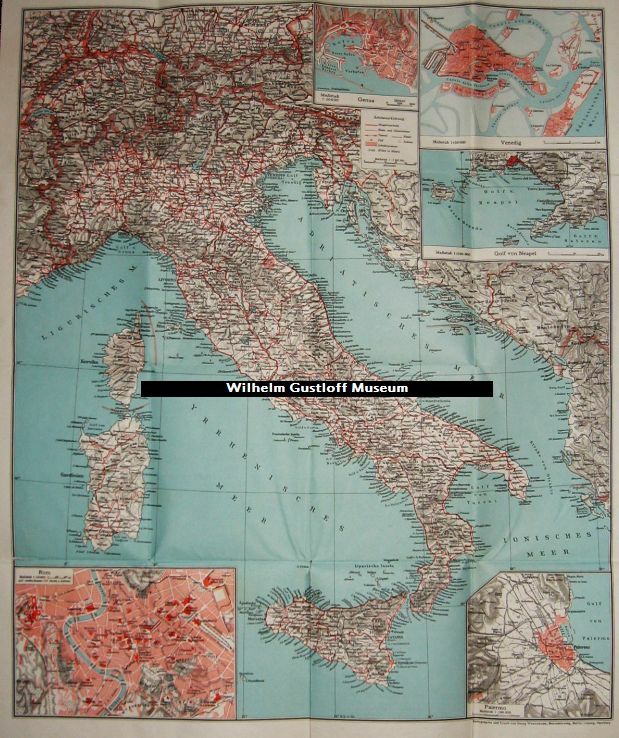 Voyage #21: November 14th - November 24th, 1938. - Each ticket booklet has most of its pages individually photographed. While most of the pages are the same, some have pieces others are missing or different destinations and information. 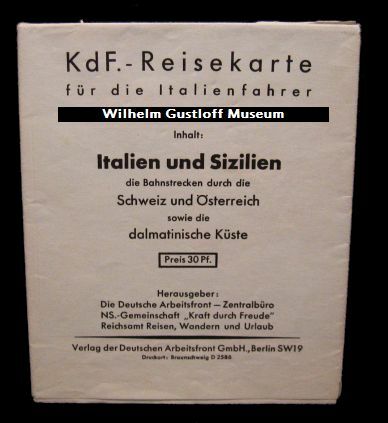 This booklet has tickets for other exotic places such as Pompeii, Innsbruck, and Venice. 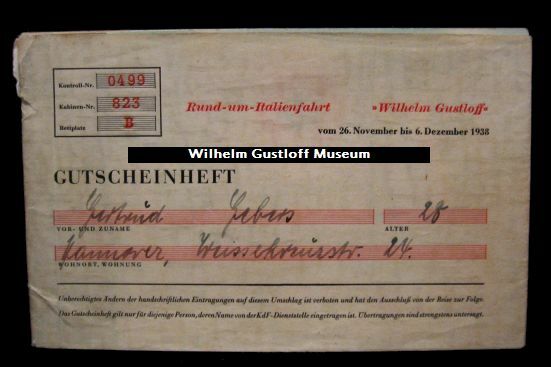 There is also an intact train ticket in the end with complete schedule. This booklet is also missing its original cover. 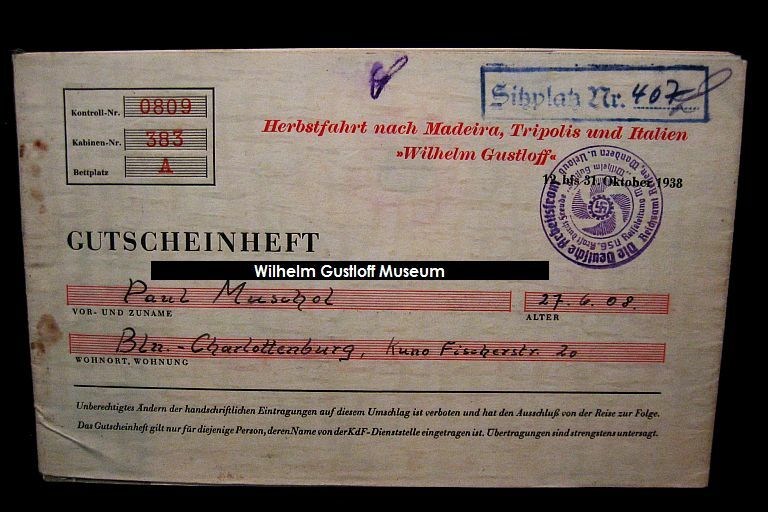 Ticket Booklet from the Wilhelm Gustloff - Italian Cruise. Voyage #22: November 26th, 1938 - December 6th, 1938. Passenger Geben Gerhund?, Kontroll-Nr. 0499, Kabinen-Nr. 823, Bettplatz B. 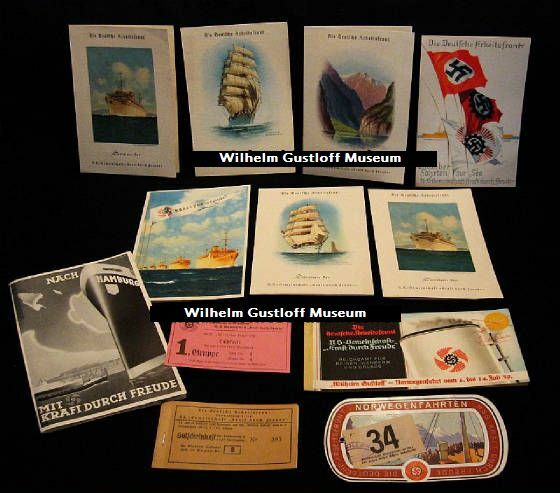 Two luggage stickers, itinerary, & ticket for the Wilhelm Gustloff. Voyage #13: Norwegian Cruise - August 21st - 27th, 1938. Voyage #9: Norwegian Cruise - July 24th - 31st, 1938. Another ticket booklet for her 19th voyage. 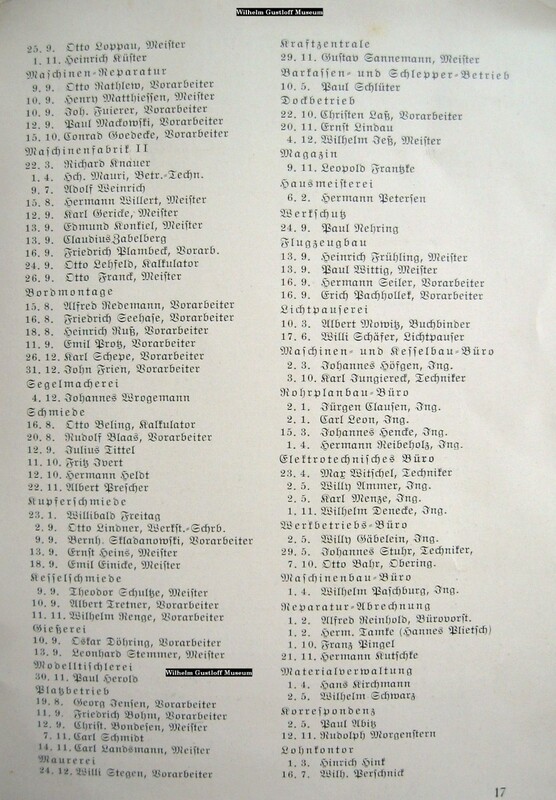 I have also noticed several people have been trying to research Wilhelm Gustloff passenger lists. 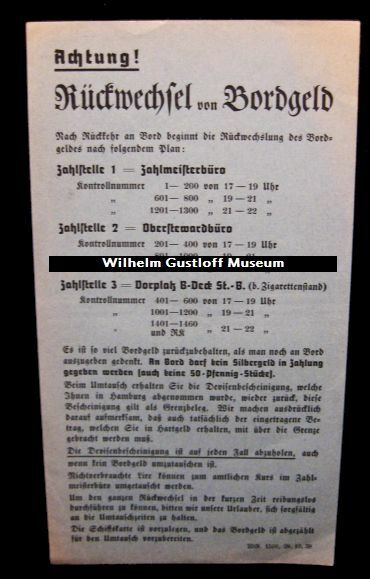 I have only ever found two passenger lists for the Gustloff; the first is an official one posted on the next page for her May 6th - 12th, 1939 voyage. The other is an informal from her maiden voyage listed under said page. Otherwise, the only names of passengers on board come from the cover of the ticket booklets with their names on the covers and vouchers. 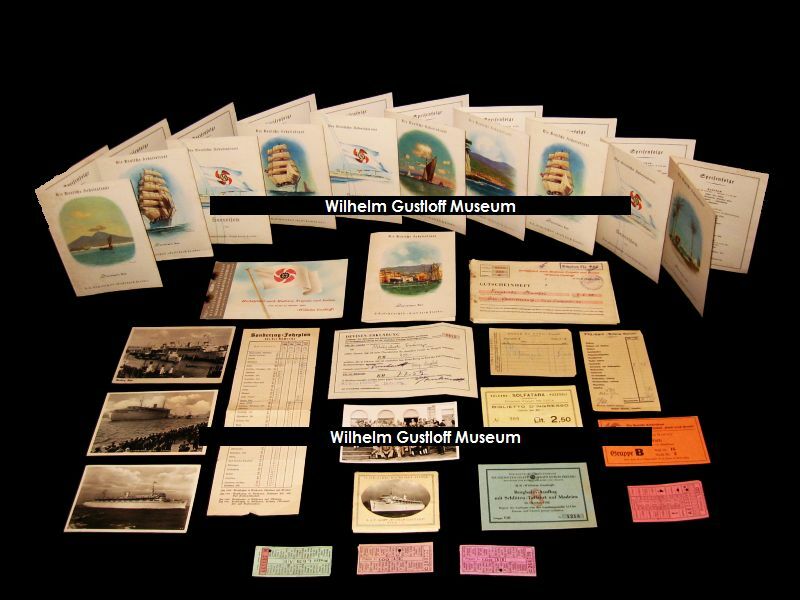 Left, Below: Another set of menus and tickets from her 19th voyage. Frankiska Muschol - Kontroll-Nr. 0810, Kabinen-Nr. 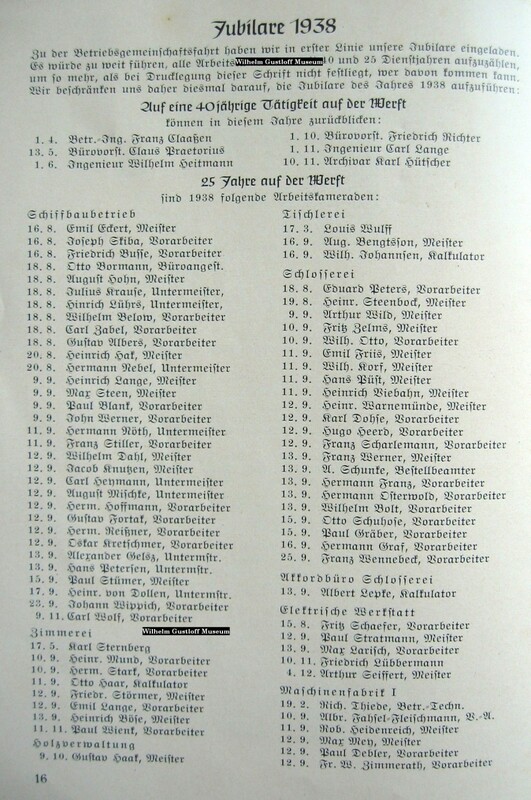 383, Bettplatz B.
July 23rd and 24th, 1938. 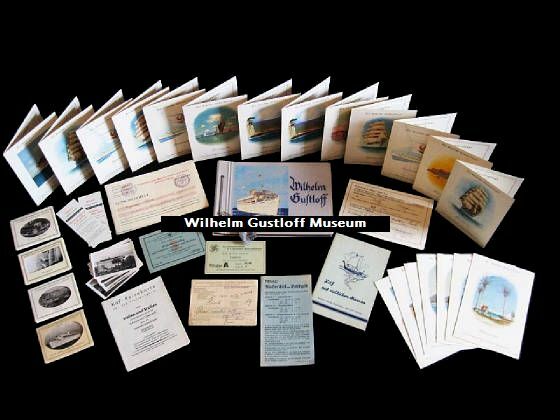 Wilhelm Gustloff lot with lighter and photo album.